Pakistani Court Says Pervez Musharraf A Fugitive In Benazir Bhutto Murder Case : The Two-Way Nearly a decade after the assassination of former Pakistani Prime Minister Benazir Bhutto, her family and party got some closure. But fugitive ex-President Pervez Musharraf remains out of reach. Supporters of Pakistan's slain leader Benazir Bhutto rally in Lahore, Pakistan, in 2013 on the sixth anniversary of her death. 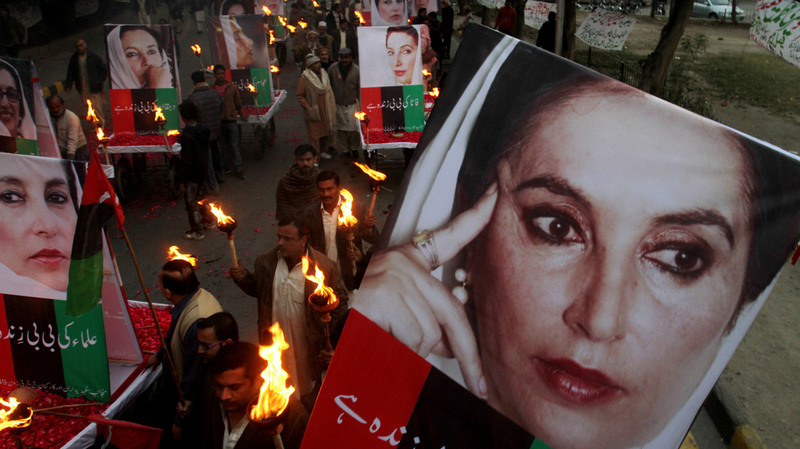 Nearly a decade after the assassination of Benazir Bhutto, a special court in Pakistan has handed down a verdict addressing the two-time prime minister's killing. The anti-terrorism court sentenced two ex-police officers to prison, acquitted five suspected Islamist militants and labeled former Pakistani President Pervez Musharraf a fugitive for failing to appear in court. The former military leader, who ruled Pakistan at the time of the assassination and has been living in self-imposed exile since last year, has long been suspected of having a role in the suicide attack that killed Bhutto and more than three dozen others after a 2007 political rally. The ruling Thursday ordered him arrested — should he return to the country — and his property in Pakistan seized for failing to show. But that didn't satisfy many of the people watching the trial closely, including Bhutto's daughter, Aseefa B. Zardari. "10 years later and we still await justice. Abettors punished but those truly guilty of my mothers murder roam free," Zardari tweeted after the ruling. "There will be no justice till Pervez Musharraf answers for his crimes!" There will be no justice till Pervez Musharraf answers for his crimes ! The two ex-officers each were jailed for 17 years and fined nearly $5,000 — one convicted "of mishandling security at the Bhutto rally and the other of mishandling the crime scene," Reuters reports. Still, the acquittals of the five alleged militants due to insufficient evidence prompted anger from members of Bhutto's party. The party spokesman, Farhatullah Babar, said he felt "disappointment and shock," saying "justice has not been done," according to The Associated Press. Bhutto's son Bilawal Bhutto Zardari, who is now chairman of her party, said they planned to "explore legal options." SMBB case decision is disappointing & unacceptable. Realse of terrorists not only unjust but also dangerous. PPP will explore legal options. Heraldo Munoz, an investigator on the United Nations probe into the assassination, talked with NPR in 2013 about why suspicions persist that Musharraf was in on the conspiracy to kill Bhutto, who at that time had recently returned to the country as a prominent opposition politician. After the rally in December 2007, "the police are nowhere to be found," Munoz explained, noting a backup bulletproof vehicle was also "nowhere to be found." Then, after the killing, "there was no autopsy done because the police impeded that from being carried out. So we'll never know, exactly, the cause of death." "Al-Qaida was certainly behind it — they gave the order. The Pakistani Taliban executed it. The local police was involved in a cover-up, in my view, because I watched the scene of the crime one hour and a half immediately removing a lot of important evidence. ... And the U.S. and the U.K. promoted [her] return but without providing any security — they didn't want to take any responsibility for that." Eyes remain trained on Musharraf, however. The general who seized power in a coup in 1999 was forced to step down months after Bhutto's death, when her party took power. Indicted on five counts of high treason in 2014, Musharraf has long maintained his innocence — though the government allowed him to leave the country last year to seek medical attention. He has not returned.